Sean McGee, an agent for the CIA, is on a routine drug trafficking case in Guatemala when his wife is kidnapped in an attempt to stop him. It has the opposite effect. McGee follows a trail of corruption leading him back to the USA. The much sought after criminal, El Tiburon (The Shark), is watching from the shadows. He has been controlling the drug borders of the USA from the inside. He is untouchable, until now. Suddenly exposed, El Tiburon fights back. But McGee and his own team of local indigenous Guatemalans and military-trained Americans refuse to back down. The tension mounts as the victims of generations of suppression join in the battle that will risk lives. McGee will rescue his wife no matter the stakes, but will this be his final fight? Corruption and greed make a compelling story. 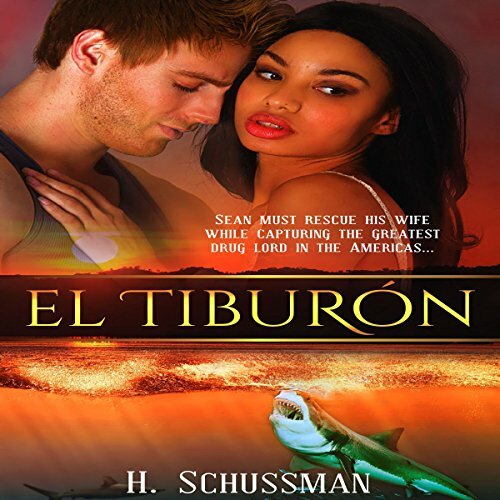 Would you consider the audio edition of El Tiburon to be better than the print version? N/A I prefer audio to print so I can do work and listen at the same time. Sport brings tenderness and toughness to story. Which character – as performed by Jim Foster – was your favorite? Jim brought all of the characters to life with his inflexion and good diction. He was easy to listen to. Finding out that there was a city under the dump was heartbreaking to learn that people lived like that. do! :) High action and suspense. A great book. If you could sum up El Tiburon in three words, what would they be? Nice story, Jim's voice is what sold the story for me. His voice was clear and each character had a specific sound and style. I have listen to alot of audiobooks and at times you can hear the performer struggling with trying to give each character their own voice. Jim does not have that problem. I look forward to listening to more of his work. Yes, but my boss won't let me work in my car. Jim Foster has a deep voice that is a pleasure to listen to. I found the story itself very engaging, and i love that it engaged my brain and my heart. This book was a good fast paced thriller that kept you wanting more. I enjoyed each of the characters and found it to be worth listening to.From the very first page until the final one...exciting! My first time reading H.Schussman writting but will not be the last. Looking forward to following exciting adventures...l love his character...in fact all the people involved are interesting. Just read and enjoy. Really entertaining, enjoyable, well written and interesting mystery thriller that keeps you glued to your iPod. The story is fast paced and constantly moving forward. Plenty of twists, turns and suspense that keep you guessing. Definitely a book worth your time. Sean is on a mission for the CIA. When a Guatemalan drug lord kidnaps his wife, Sean will do whatever it takes to get her back. What he doesn't realize is just how tough and resourceful his wife actually is. Great characters. Love a story that has smart, interesting and independent characters. Love that the author incorporated an overlooked group of people. James Foster does a really good job with the narration. Great voice easy to listen to for hours. Good character voices. Clearly spoken with a smooth even pace. Occasionally his narration could of used a little more enthusiasm. Overall though, very enjoyable. Background noise occasionally throughout the book. Chapter 23 overlapping narration can't tell what is being said. I even re-downloaded the book just to double check and it was the same. I would really like to know what was in the chapter I couldn't listen to. Good follow up book to Counterpart! I enjoyed H. Schussman's first book, Counterpart. This book is a good second! I actually read Counterpart but listened to El Tiburon on Audible. As someone who uses Audible a lot, I struggled with the reader of the book. He was not feeling the book. That's the best way I can describe it. There were a few issues with his Spanish pronunciations also. Lastly, I'm not sure if this was just because of Audible on my phone, but there were three chapters that I could not listen to because the reader's voice was doubled. He was reading over himself. Not sure if anybody else has experienced this issue. I want to applaud H. Schussman for another well told story! Looking forward to number three! The main character, Sean, is on a drug case when his wife is kidnapped by the drug lord. up even more as Sean races to put a stop to the drug trafficking and find his wife. Jim Foster did well with the narration.